Background: The SAGES Learning Center offers the opportunity to expose surgeons of varying backgrounds to new training methods. We used this venue to assess surgeons¡¦ initial performance on a virtual reality (VR) trainer and to determine if this brief initial exposure is associated with capacity for learning and perception of educational value. 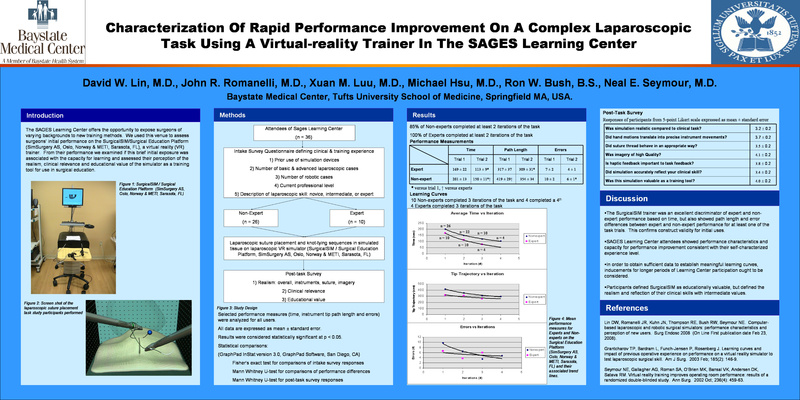 Methods: Attendees of the SAGES Learning Center were invited to perform laparoscopic suturing and knot-tying using a SurgicalSIM (METI, Sarasota, FL, SimSurgery AB, Oslo, Norway) VR trainer with measurement of task time, instrument tip path length, and error quantity. Prior to starting, participants characterized themselves as expert or non-expert and defined their laparoscopic experience (number of basic and advanced cases). Perceptions of the quality of the simulator experience (realism, educational value) were surveyed after simulator use (7 items, 5 point scale). Results: Data from 26 non-expert and 10 expert users were gathered. 85% of non-experts and 100% of experts completed at least 2 iterations of the task. Data table shows performance measurements collected from the simulator (mean±SEM). From the exit survey participants defined SurgicalSIM as educationally valuable (4±0.2) but defined the realism of the experience with intermediate values (3.2-3.7±0.2). Conclusions: The SurgicalSIM trainer was an excellent discriminator of expert and nonexpert performance based on time, but also showed path length and error expert and non-expert performance differences for at least one of the task trials. This confirms construct validity for initial uses. SAGES Learning Center attendees showed performance characteristics and capacity for performance improvement consistent with their self-characterized experience level. In order to obtain sufficient data to establish meaningful learning curves, inducements for longer periods of Learning Center participation ought to be considered.